I have to confess, I'm a pasta maniac! I just love all kinds of pasta and I can eat it anytime. There are so many great things about pasta... like it's so easy to make, extremely versatile, you can eat pasta cold or hot, it's delicious both sweet and savoury and much more. I know, since low carb diet has become so popular, pasta is no more on menu of many people, even so I still like it. Beside this, another thing I love, and apparently more diet friendly, is spinach. 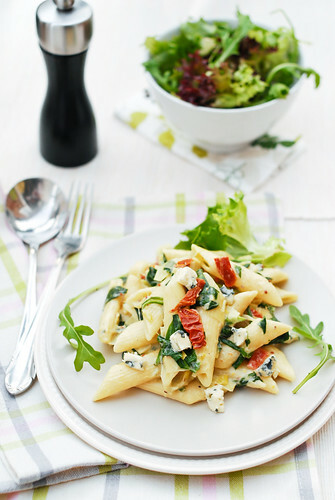 For me, pasta and spinach is an unbeatable combination. My all time favourite is spinach and garlic creamy pasta with chicken. This time, though, I wanted something else. I was searching the web for a while and end up with a recipe from BBC Good Food. Unexpectedly I had most of ingredients needed for the recipe, which led to only minor recipe modifications. I really liked the combination of leek and spinach in this recipe which blended well with dried tomatoes. 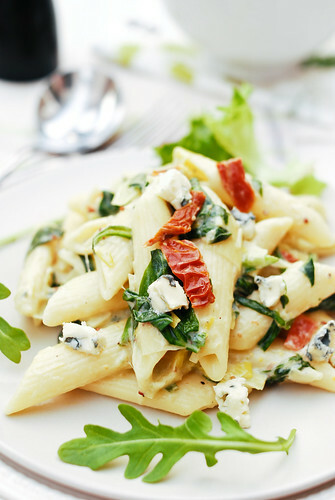 It's very important to use the given amount of the blue cheese to give the pasta a distinctive taste. 1 Melt the butter with the oil in a large pan, add the leeks and splash in a little hot water. Cover and cook over a low heat, stirring occasionally, for about 10 minutes until no longer squeaky. 2 Meanwhile start boiling salter water for the pasta and cook according to the packet instruction. 3 Combine Philadelphia with double cream and tip it with the mustard into the leeks, add three quarters of the cheese and season well. Stir well until the cheese melts. Take off the heat. 4 Drain the pasta, reserving the cooking water. Tip the pasta into the sauce and stir. Add enough cooking water to make the sauce coat the pasta. Stir in the spinach, a big handful at a time, until it wilts, splashing in a little more water if needed. Add the tomatoes, sprinkle with the remaining cheese and serve.